I've been waiting for this one. Not this particular game, mind you, but rather for one very much like it. And I'm not so sure that the correct word shouldn't be "dreading." This is because I lack the free time to be hooked on something like Tower Toppler, thelatest arcade-action addiction from Epyx. The premise is simple enough. 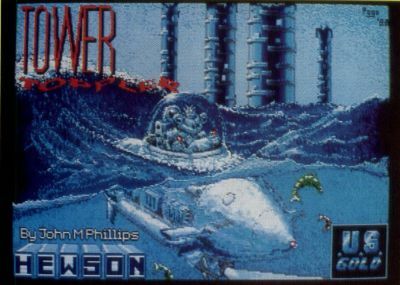 In the middle of a toxic ocean rise two sets of eight towers. Your goal is to climb each progressively more difficult donjon, avoiding a whole slew of passive and active hazards that confront you. 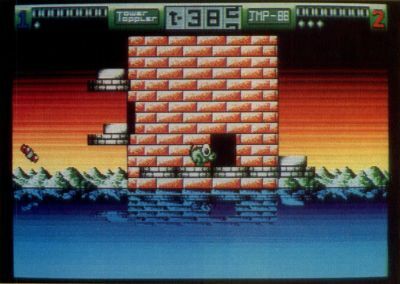 However, as these dangers merely knock you down, rather than kill you outright, and because you often catch yourself before you take a dip in the deadly waters, most players will find the time limit to be their most persistent enemy. But what keeps you masochistically coming back for more are the towers themselves. Each one is a labyrinth with breakaway trap floors, barricades and only one way to the top. And even after you find the way, you'll need split-second timing to do it consistently enough to finish all seven towers consecutively. 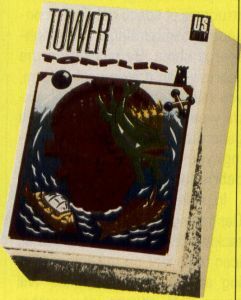 Truly successful arcade games require an identifiable protagonist, and in this department, Tower Toppler excels. True, while the small, green, Q-Bert-like creature with the huge, expressive eyes may not go down in high-resolution history as the next Pac-Man or Donkey Kong, he is just weird enough to grab your attention. 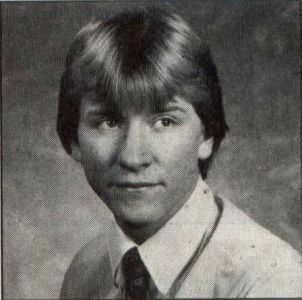 And if he doesn't enthrall you, the superb graphics will. The towers rotate smoothly as you circle up them, and every item in the game is finely shaded and detailed—truly arcade quality. Control is, likewise, sure and precise, and the action is supplemented with realistic sound effects and mindless music that will hypnotize you through hours of plays. As if this isn't enough, the bonus rounds will provide just the impetus you need to complete just one more tower before powering down. All in all, Tower Toppler is a primer on just what makes a great arcade program. As I mentioned earlier, you've got the cute creature, you've got danger, you've got challenge. Just keep in mind that once you boot this one up, it's unlikely that you do anything else until it is conquered. Consider yourself warned.